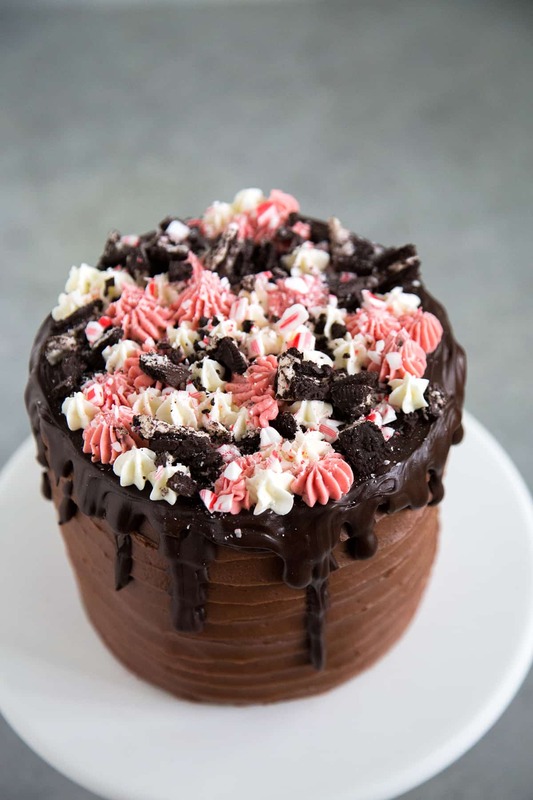 Candy Cane Cookies and Cream Cake: a winter cake that combines peppermint, cookies, and chocolate! Farewell 2016. It’s been one heck of a year. Naturally, there were ups and downs. It was a tough year with more heartbreaks and tears than I’d like to remember. However, despite all the setbacks and complications of my personal life, one amazing thing did happen this year. 2016 will forever be immortalized in my memories as the year I was fortunate enough to marry my best friend. I’m looking forward to 2017. I’m eager for a fresh start. I’ve never been one for resolutions, but I do have a handful of food blogging related goals I’d like to accomplish next year. 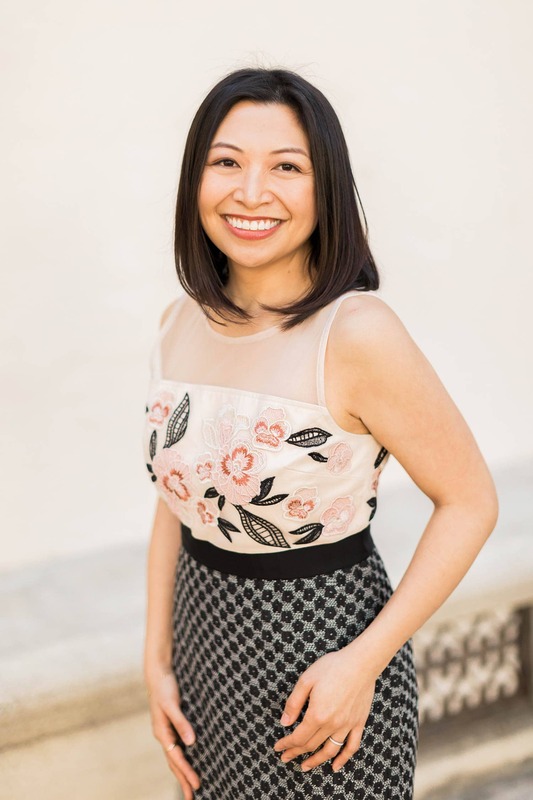 Learn how to cook more Filipino dishes. Take the time to make more birthday cakes/I’m thinking of you cakes/I hope this cheers you up cakes for friends and family. As a fan of all things cookies and cream related and I felt it was a time to create a holiday version. I’m a sucker for the impulse buy items they strategically place at the check out aisles at Trader Joe’s. I go to the store with a list for milk, butter, eggs, and string cheese. During the holidays, I end up leaving with every seasonal item they have: an assortment of chocolate truffles, gingerbread cookies for me AND the dogs, mini panettone, mint dark chocolate star cookies, and too many boxes of Candy Cane Joe-Joe’s. Midway through a box of Candy Cane Joe-Joe’s, I decided that I needed to bake the remaining cookie sandwiches into a holiday cake. I adapted the cake from my coconut confetti cake by adding chopped cookie sandwiches and replaced the coconut milk with regular milk. I used a standard Swiss buttercream with a few drops of red gel food coloring to the get that festive pink color. 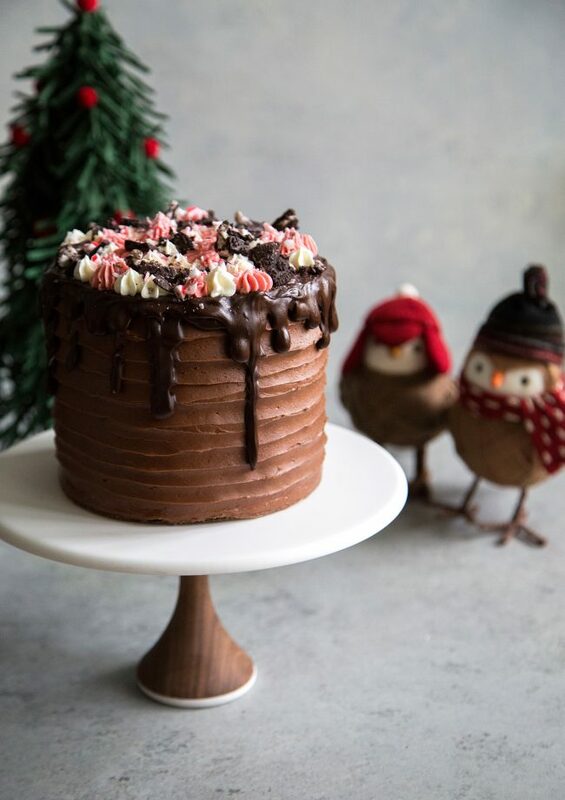 And because all holiday desserts should have chocolate, I frosted the cake with super simple chocolate buttercream and a nice drizzle of melted chocolate on top. 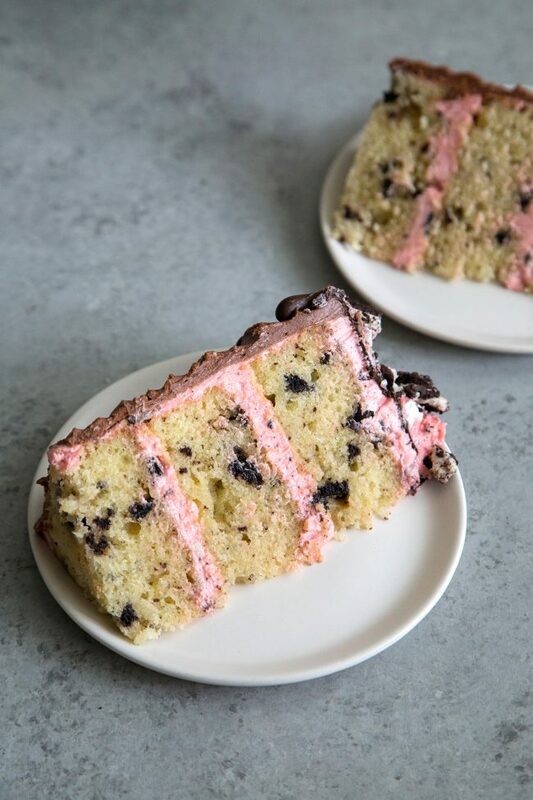 You can easily swap out regular Oreos (or any sandwich cookie) to make this a cookies and cream cake you can enjoy all year long. However, I must warn you- this cake is very rich. It’s better shared with friends. Happy New Year, friends! I wish you a joyous, healthy, and prosperous 2017! Preheat oven to 350 degrees F. Line three 6-inch round cake pans with parchment paper. Grease lightly and set aside. Whisk together flour, baking powder, and salt. Set aside. In the bowl of a stand mixer fitted with a paddle attachment, combined butter, coconut oil, and sugar. Add eggs and beat until mixture is pale in color. Scrape down bowl as needed to ensure thorough mixing. Alternate adding flour mixture and milk, beginning and ending with the flour. Mix on low speed until combined. Fold in chopped cookie sandwiches. Divide batter among the three prepared cake pans. Level batter and bake for 35-40 minutes until the cakes are golden brown and a toothpick inserted in center of cake comes out clean. Let cool in pan for 5 minutes before unmolding. Allow to cool to room temperature on wire rack. 1. In the bowl of a stand mixer, whisk together egg whites and sugar. Place bowl over a pot of simmering water to create a double boiler. Make sure simmering water does not touch the bottom of the bowl. Whisk sugar egg mixture until it reaches a temperature of 160 degrees F.
Alternatively, if you don't have a thermometer, heat until all the sugar has melted. You can test this by dipping your pointer finger into the warm mixture and rubbing it against your thumb. The mixture should be smooth. You should not be able to feel the granules of sugar. Return bowl to the stand mixer. With the whisk attachment, beat mixture at medium speed until it has cooled to room temperature and mixture is at medium stiff peaks. Reduce speed to low and add butter one tablespoon at a time. Once all the butter has been incorporated, add a pinch of salt. Increase speed to medium-high and continue to beat until buttercream is light and fluffy. If desired, add a few drops of red gel food coloring to achieve pink color. Fold in chopped sandwich cookies. Set aside until ready to assemble cake. In the bowl of a stand mixer fitted with a paddle attachment (or using a hand mixer), cream butter until smooth. Sift together powdered sugar and cocoa powder. Add to bowl in three additions. Mix on low speed after each addition. Add salt and milk. Mix until combined. Adjust consistency according to preference. If buttercream is too thick, add milk 1 Tbsp at a time until desired consistency is achieved. If buttercream is too thin, add 1/4 cup sifted powder sugar (up to 3/4 cup). Set aside until ready to use. 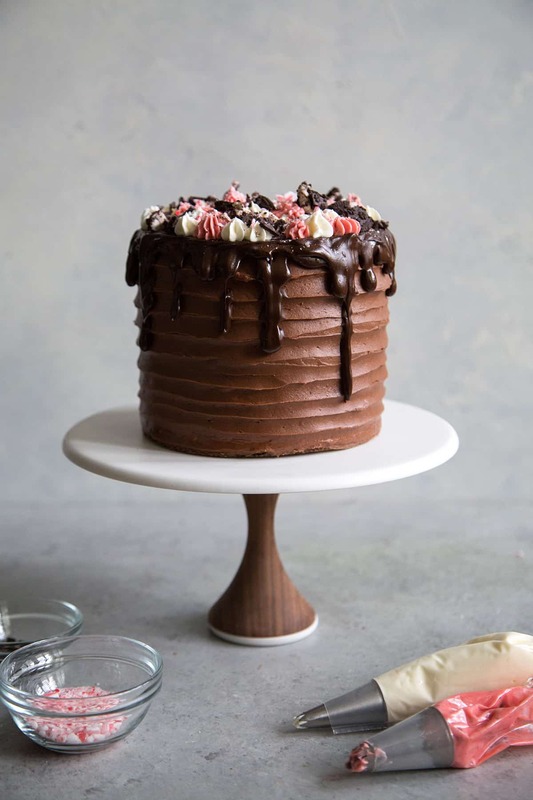 Place one cake round on cake stand, or serving dish of choice. 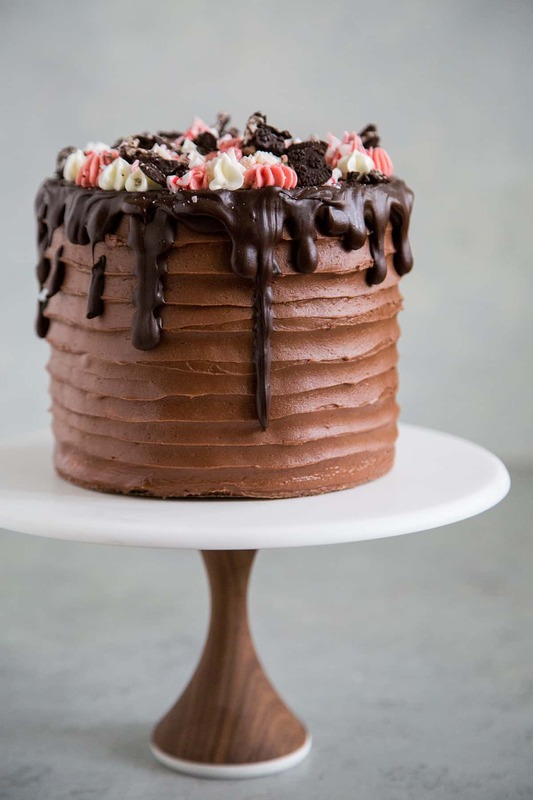 Spread a thin layer of Swiss buttercream. Top with second cake round followed with thin layer of Swiss buttercream. Finish with remaining cake round. Spread Swiss buttercream all over cake to seal in the crumbs (crumb coat). Let chill in the refrigerator for at least 15 minutes. 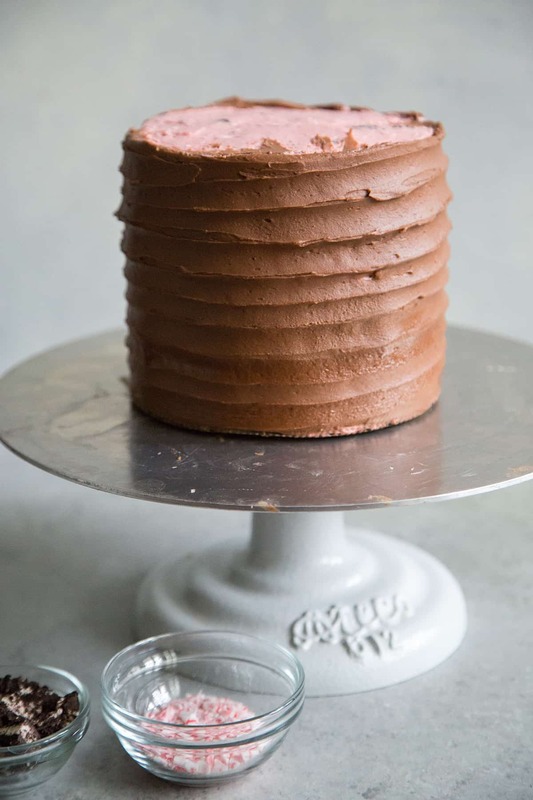 Once cake is chilled, spread chocolate buttercream over cake. 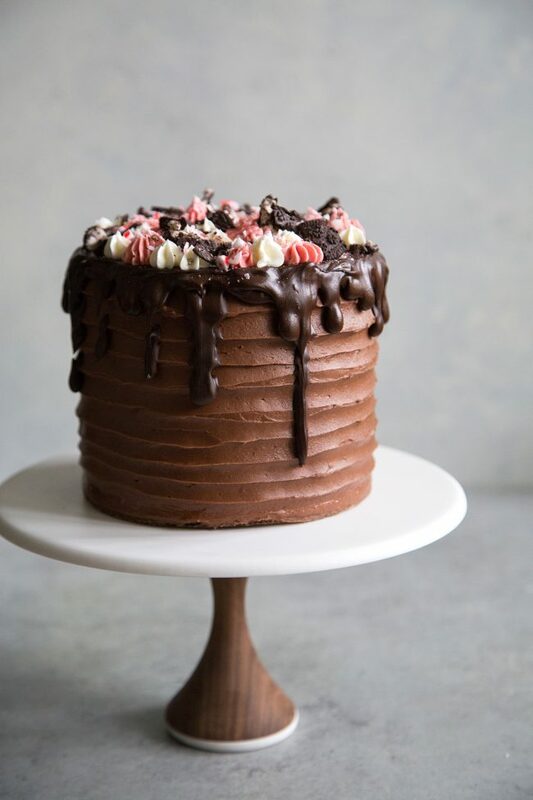 Pour melted chocolate over finished cake. Decorate cake with additional piped buttercream and chopped cookie sandwiches. I used the Candy Cane Joe-Joe's from Trader Joe's. Mint Oreos would be a great substitute. happy new years! (or almost, anyways). excited to see filipino food, since my comfort zone is limited to chicken adobo and leche flan. and i feel you about the candy cane joe joe’s; there’s 3 boxes in my house rn, oops.